Head over to Amazon to get a decent deal on facial tissues. You can get 6 boxes of 124ct Puffs Soft & Strong for $9.12, but you can do a few things to get the price down. First, buy using Subscribe & Save. This can easily be cancelled after the order ships via your Amazon Account Page. (select 6 months, which gives you plenty of time to cancel) Then, "clip" the $0.25 off coupon found on the product page. 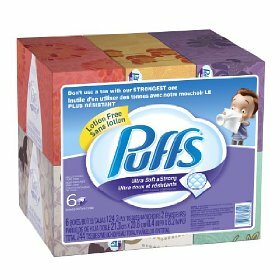 The final price will be $8.41, which works out to be $1.40 a box, a great price for Puffs!